In February 2013 the learning team at Pollok House hosted a series of children's writing workshops. These included, art and poetry, writing in Scots, nature in poetry, writing a story, and writing a song. 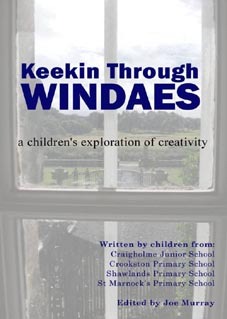 Also present were five professional writers highly experienced in working with children: Brian Whittingham, Linda Jackson, Liz Niven, Ken Cockburn and Gerry Loose. Around 150 children from four local schools attended the workshops held over three full days  each child attended two different workshops during their visit. The schools were: Craigholme Junior School, Crookston Castle Primary School, Shawlands Primary School and St Marnocks Primary School. This book contains poems, stories and songs from 48 of those children.